Q: According to reports, the US side warned on December 4 that Russia has 60 days to become compliant with the Intermediate-range Nuclear Forces (INF) Treaty or the US would also cease obeying it. What is your comment? The US side also said that it has asked China many times to join the INF Treaty but was turned down every time. What is your response? A: On your first question, the INF Treaty has played an important role in easing international relations, advancing nuclear disarmament process and maintaining global strategic balance and stability. It is still highly relevant today. A unilateral withdrawal from it will cause negative impacts on many fronts. On your second question, the INF Treaty is a bilateral one reached between the US and the former USSR. China opposes its multilateralization. Meanwhile, China's national defense policy is defensive in its nature, and we have been adopting a highly restrained attitude when it comes to developing our military forces. We have no intention to and will not threaten any other countries. Q: I am just wondering whether the Foreign Ministry has anything to add to the statement made by the Commerce Ministry on the China-US trade issues, including the comment on Trump saying on Twitter that he is a "tariff man"? 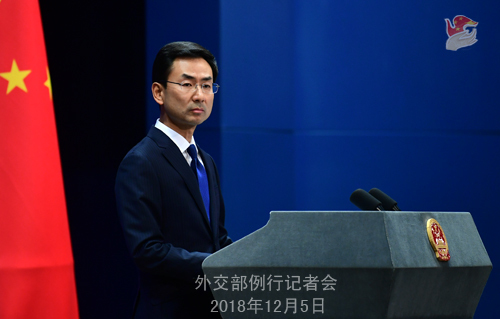 A: You may all have noted that this morning the spokesperson of the Commerce Ministry made an official statement on the China-US trade issues. As to the specifics you are interested in, I would still refer you to the Commerce Ministry. What I can say here is that we hope that the working teams from China and the US could follow the consensus reached by the two heads of state to step up consultations and reach a mutually beneficial agreement at an early date. Q: First, the statement by the spokesperson of the Commerce Ministry this morning in fact confirmed the existence of a 90-day consultation plan. The US side believed that the 90-day period started from last Saturday and would end on March 1, 2019. In China's view, when does that begin? Second, dozens of China's government agencies yesterday issued a memorandum on intellectual property rights. Can you offer more details? President Xi Jinping said that China will address the "reasonable concerns" of the US side. Does that include intellectual property rights protection? A: On your first question, just like my reply to the previous question, the spokesperson of the Commerce Ministry has made a statement on relevant issues. As to the specifics you want to know, I would refer you to the Commerce Ministry. On your second question, you may all have noted that 38 Chinese agencies including the National Development and Reform Commission, the People's Bank of China and the National Intellectual Property Administration signed the memorandum of cooperation for joint efforts to strengthen punishment for intellectual property infringements. 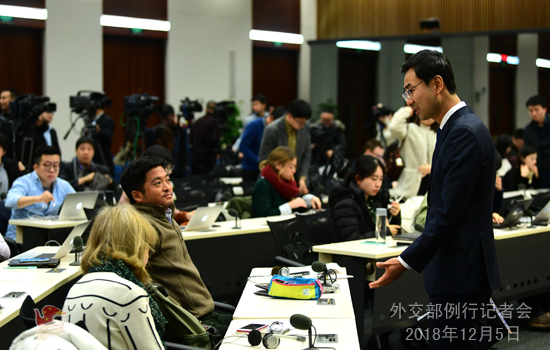 It is the latest step by China in strengthening the protection of intellectual property rights and cracking down on the relevant unlawful activities. As for the discussions between China and the US on the intellectual property rights, these discussions have been going on continuously. The US side is also very clear with China's position and attitude on this issue. We are also committed to engaging in further discussions with the US side on properly resolving the relevant issue. Follow-up: That memorandum is dated November 21, but was not released until yesterday. Does this timing have anything to do with the China-US leaders' meeting? A: I am not aware of the specifics. You may ask the competent department. There can be a lag between when a document is issued and when it goes public. There is nothing special about that. Q: According to reports, on December 4, US Secretary of State Mike Pompeo said in his speech that there will be a new democratic world order in which the US will strengthen or jettison relevant international agreements so as to stop bad actors like China. What is your response? A: The latest remarks made by the US side do not accord with the spirit of the China-US summit which was held not long ago. Several days ago, the two heads of state have just held a successful meeting on the sidelines of the G20 summit and reached important consensus. Besides reaching consensus on the trade issues that you are all interested in, the two sides also agreed to expand cooperation on the basis of mutual benefit, manage differences on the basis of mutual respect and jointly promote the China-US ties which are underpinned by coordination, cooperation and stability. Many media agencies reported that at the end of the meeting, applause broke out in the room. I don't know for what purpose someone would applaud then and now say something like this? With regard to China's status and role in the international community, we have kept stressing that China will always be an architect for world peace, a contributor to global development and a guardian of international order. 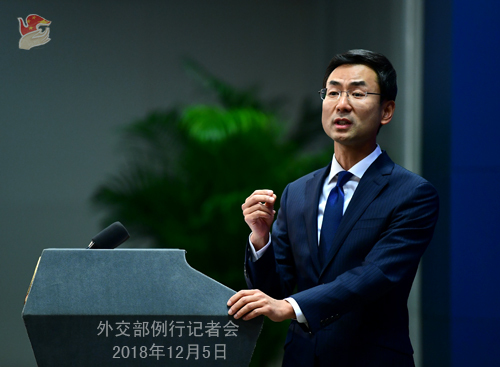 China is committed to championing multilateralism, upholding the rules-based international order and the multilateral system with the UN at its core, building a new type of international relations and forging a community with a shared future for mankind. As to how the US behaves on the world stage, I believe that the international community has a fair judgment. Over a period of time, the US wields the baton of unilateralism and protectionism to disturb the international order under the pretext of "America First" and has withdrawn from a series of international organizations and treaties to challenge the multilateral system. The international community knows fully well that what the US said or did is motivated by self-interest and the US applies multilateral rules in a selective manner. At last, I want to stress that, as we always say, China and the US are respectively the world's largest developing country and developed country. As two major countries with important influence, China and the US are interdependent and they cannot change each other. As an old saying goes, a harmonious bilateral relationship will make both winners, while a confrontational one will make both losers. We hope that the US could meet China halfway and follow the consensus reached by the two heads of state to jointly promote the sound and steady development of bilateral ties and bring more good news and more tangible benefits to the two peoples and people around the world.